t*rexes and tiaras: Around the world.. 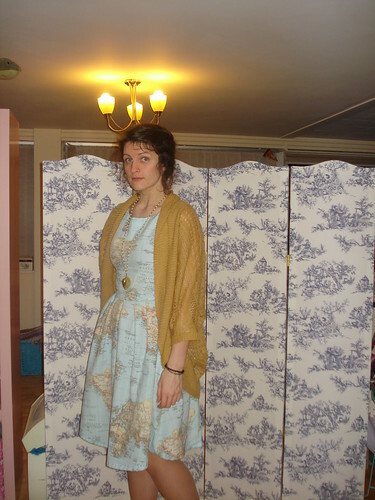 I guess a measure of whether or not I've done a good job of making a particular dress would be whether I actually wear it, rather than letting it languish in the depths of the wardrobe, right? 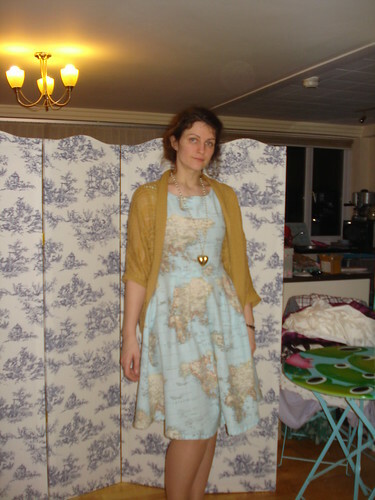 If that's the test than my map print dress can certainly be considered a winner. I've already worn it three times since making it a few weekends ago at Sarah's house. 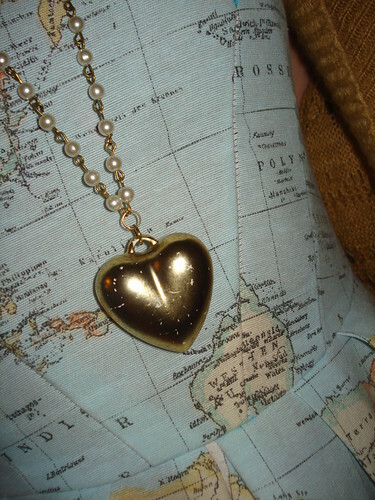 I recently rediscovered this necklace and since then have been wearing it a lot with this dress, and various others. I remember dismissing it when the gold of the heart started to get a little scratched, but these days I kind of think that adds to it's charm. Shabby chic and all that...? I'd forgotten about these shoes until I was looking for something which would make the quirky map print meeting appropriate. I think that with the almost-neutral tones of the shoes and the shrug, it sort of is...? I was complimented on the dress itself at work, anyway. Which is always nice. Only one day down so far this week and I'm already longing to seek refuge in the weekend. Which, incidentally, isn't even going to be a quiet one, with a guides camp-out on Friday night, a Ranger sleepover on Saturday and a cinema trip on Sunday night - crikey. I love this dress, the material is perfect. Where did you buy the material? Love the dress! The fabric is amazing! This outfit is gorgeous, that dress is so so pretty!